30 individuals were sterilized, of whom 20 were women (Paul, p. 254). 80% of victims were considered mentally ill, and the remaining 20% mentally deficient. Although the compulsory sterilization law was enacted in 1929, no sterilizations occurred until 1932. The last sterilization took place in 1956 (Paul, p. 252). The first twenty eugenic sterilizations occurred in 1932. A single sterilization occurred in 1949; another single sterilization took place in 1955. Eight sterilizations occurred in 1956. No sterilizations have been recorded following this year (Paul, p. 254). The rate of sterilizations per 100,000 residents was approximately 4 in the year of 1932. 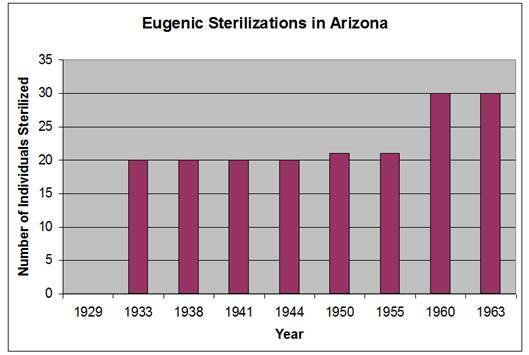 Arizona passed a compulsory sterilization law on March 9, 1929. No amendments were made to the law (Landman, p. 92; Paul, p. 252). Although the law was quite detailed in its content, a lack of enforcement from the Superintendents of the Arizona State Hospital resulted in little sterilization (Paul, p. 252). The law authorized the compulsory sterilization of individuals “afflicted with hereditary forms of insanity that are recurrent, idiocy, imbecility, feeble-mindedness, or epilepsy… and by the laws of heredity is the probable potential parent of socially inadequate offspring likewise afflicted” (Paul, p. 252). It was the choice of the Superintendent of the Arizona State Hospital to initiate the legal process by which an individual could be compulsorily sterilized. Once the Superintendent had recommended vasectomy or salpingectomy, the individual would be referred to the state board of medical examiners to verify the individual’s disability. The individual was given thirty days in which he/she could appeal against the sterilization in the superior and supreme courts of the country (Landman, p. 92). The State Asylum for the Insane, later renamed the Arizona State Hospital, was rebuilt in 1911 after a fire and included two new buildings. With the addition of the new “Community Center,” the population of inmates rose rapidly to 568 by 1922, 998 in 1942, and 1,200 in 1945. Simultaneously, a staff shortage occurred due to World War II (Arizona State Hospital). The overpopulation of the institution and the need to “safely” release inmates may have contributed to the passage of the law, which specifies that the Superintendent of the Arizona State Hospital must recommend individuals. This indicates that only individuals in the institution were targeted for sterilization. All of the individuals who were sterilized were considered either mentally ill or mentally defective. All victims of the Arizona sterilization law were recommended by the Arizona State Hospital Superintendent, and were therefore inmates of the Arizona State Hospital. Originally the “Insane Asylum of Arizona” when it was founded in January 1887, was renamed "Territorial Asylum for the Insane" in 1902 (Arizona State Hospital). 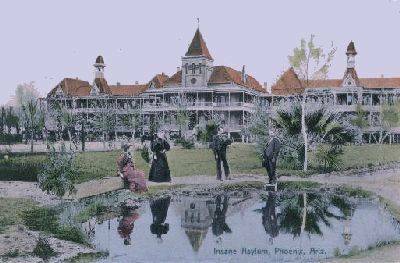 After a fire the name was changed in 1911 the hospital was rebuilt and renamed the "State Asylum for the Insane" in 1913 (Arizona State Hospital). Finally in 1958 the building went through its final name change and was dubbed the Arizona State Hospital (Arizona State Hospital). Though the institution began small with a mere 61 "feebleminded patients", it would eventually grow to include thousands of men women and children (Steckner, p. 62). By 1922 the patient population was already 568 and growing (Arizona State Hospital). Though World War II created staff shortages the number of patients continued to grow steadily reaching 998 in 1942, and 1,2000 in 1945 (Arizona State Hospital). In the early 1950s the patient population was nearly 1,800 (Arizona State Hospital). The dramatic increase in patients was due to a few contributing factors including the admission of Japanese patients from war relocation centers and war causalities (Arizona State Hospital). Empty since the 60s, the superintendent building that was added in 1912 still remains, and is the first building visitors see when they enter the grounds (Steckner, p. 62). Hospital officials want to list the building on the National Register of Historic places and to turn the building into a mental health museum and open it to community groups (Steckner, p. 62). However, little progress has been made. Although the Arizona State Hospital website has a detailed overview of the history of the site, there is no mention of the institution's involvement in eugenics (Arizona State Hospital). Arnold v. Sarn was a court case in the 1980s in which a class action suit was filed against both Arizona Department of Health and Services and Arizona State Hospital. The 1989 decision stated that "Arizona has failed to meet its moral and legal obligations to our state's chronically mentally ill population" (Arizona State Hospital). The decision also set restrictions and requirements at Arizona State Hospital (Arizona Senate Research Staff). Paul, Julius. 1965. "'Three Generations of Imbeciles Are Enough': State Eugenic Sterilization Laws in American Thought and Practice." Unpublished ms Washington, D.C.: Walter Reed Army Institute of Research.